In this issue: Wisconsin Poet Laureate Max Garland on the state of the arts in Wisconsin. 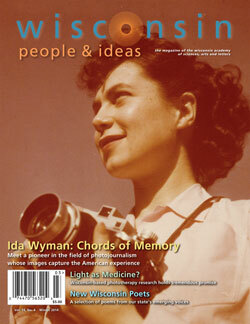 The life and images of photojournalism pioneer Ida Wyman. The emerging science of phototherapy. Mike Rebholz's photo essay Ten Weeks: Ice Fishing in Wisconsin. Interview with poet Angela Sorby. Alta Charo on the billion dollar scam behind stem cell treatments. Poems from new(ish) Wisconsin poets, a story by Geoff Collins, book reviews of new Wisconsin titles, and more. Scroll down to read articles online or browse a digital version of the magazine in our new Issuu reading room. There are a number of horrible diseases that we face in our lives and in the lives of our friends. There is an inherent distance to photographing on the ice. It is a long way from shore to where the fish and the shanties are clustered, and this distance is almost always a component of the photographs. First off, congratulations on your collection The Sleeve Waves winning the Felix Pollak poetry prize. Ida Wyman, now 87 and a relative newcomer to Madison, may not be familiar to younger Wisconsinites. But it’s likely her post-war photographs will strike a chord with older ones. Good Stock: Life on a Low Simmer (Agate Midway, 2013) is an apt title for the new memoir—with recipes—by Milwaukee chef Sanford D’Amato. A year ago I was doing what any sane adult does on a sub-zero night in Eau Claire: sharing a plate of fried cheese curds and ordering a second round at Houligan’s. The boy is walking about forty feet behind his mother. The two of them, the mother and the boy, are walking in the snow on the shoulder of a straight highway on a gray windless day. I grew up in Chicago. And whenever I meet someone else from there, I feel like we have an immediate connection. We may never explore the reason for this connection, explore the experiences we share.